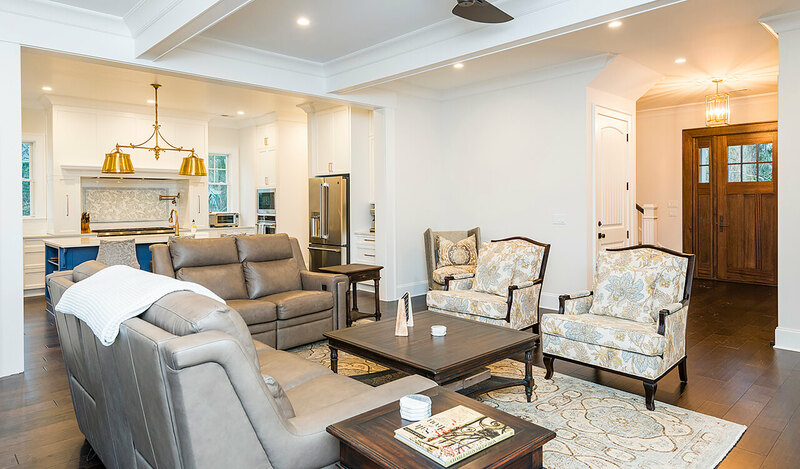 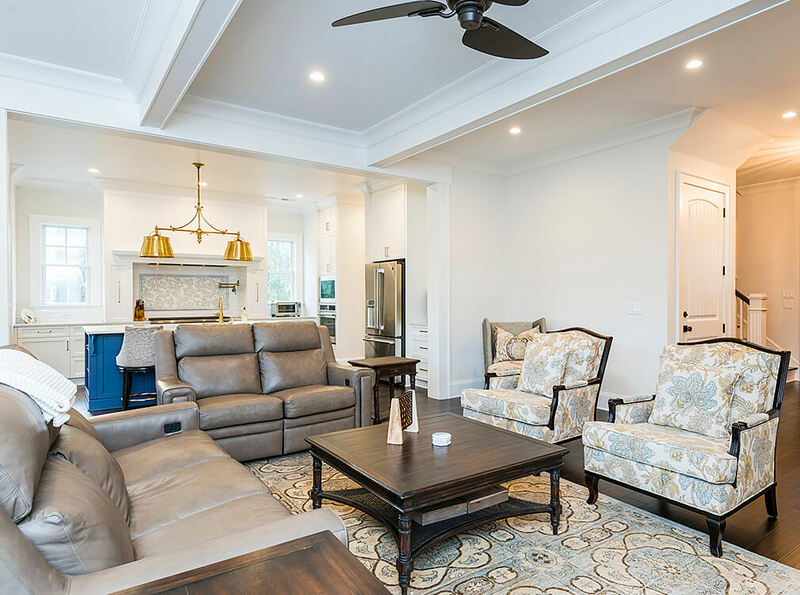 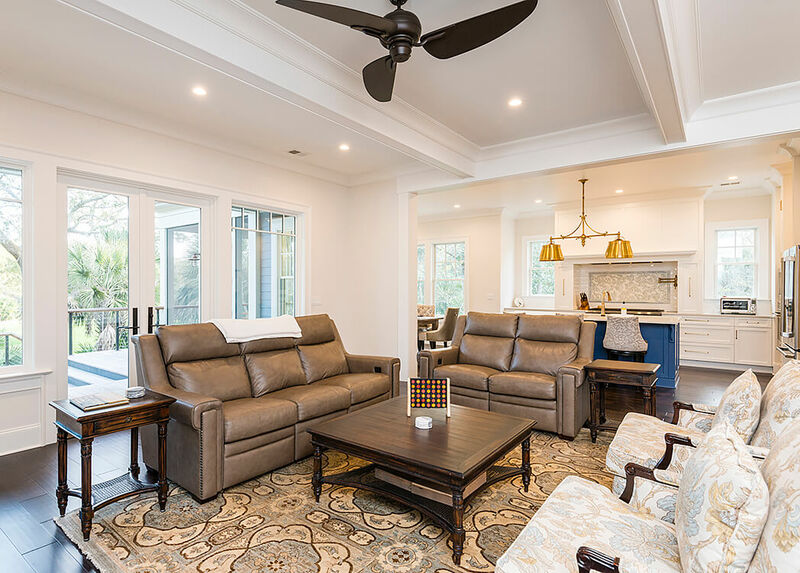 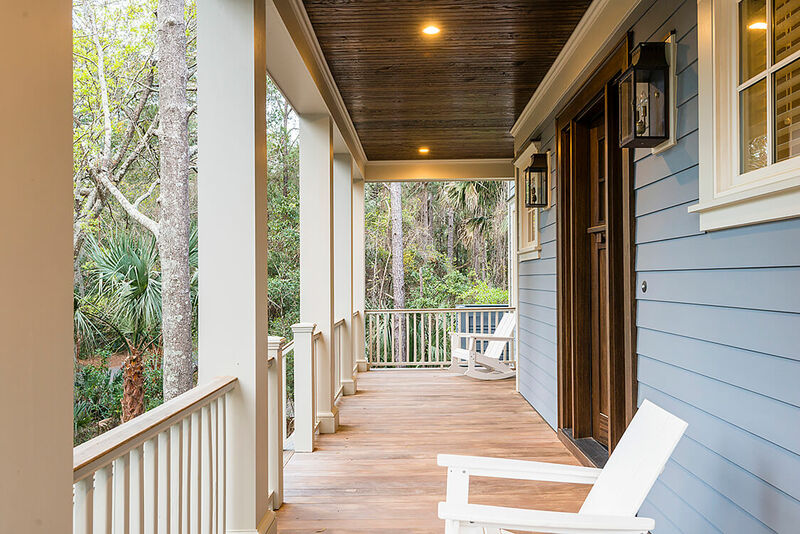 Designed and built by the award-winning Dolphin Architects & Builders, the newly constructed home at 303 Marsh Cove Road, tucked away on a quiet cul-de-sac near the Kiawah River, exudes coastal charm from the first approach. 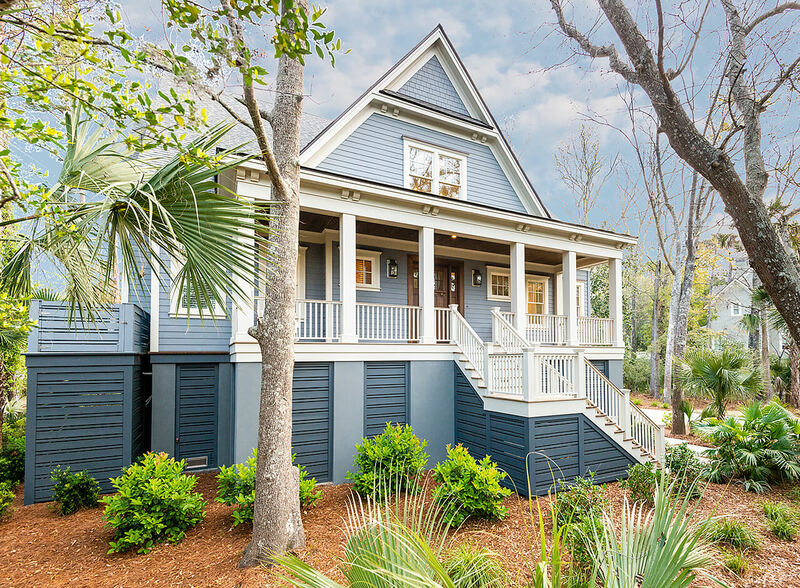 A wide covered front porch with wooden ceiling and appealing elements like a blue cement-board exterior, arts-and-crafts inspired windows, roofline details including corbels, and side-entry garage with carriage-style doors welcome guests. 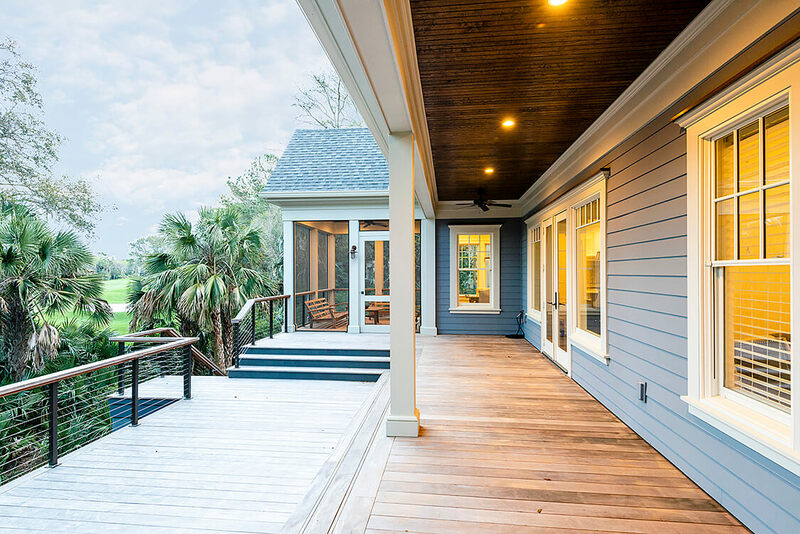 And to the rear, with verdant views enjoyed from a spacious sundeck and screened porch, lies hole no. 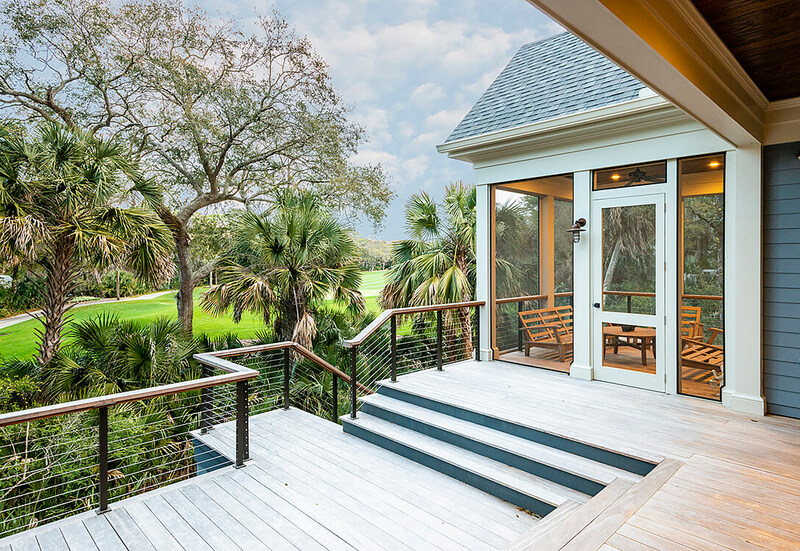 4 of the Tom Fazio-designed Osprey Point golf course. 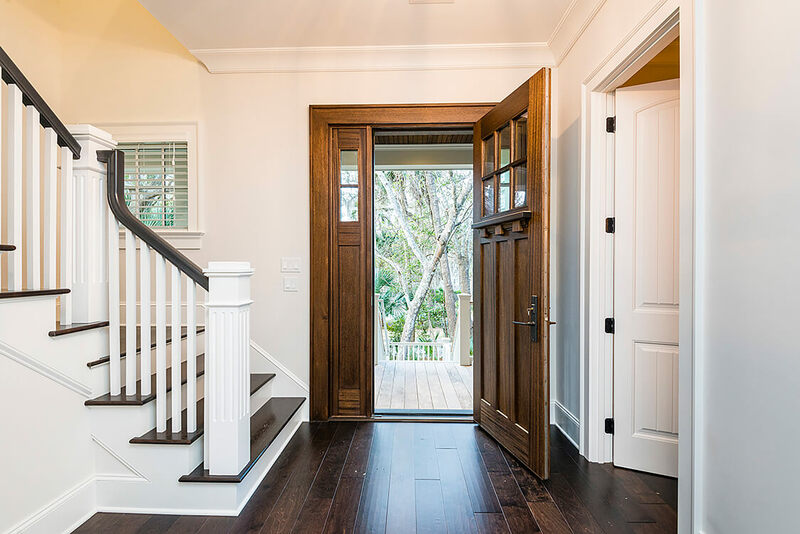 A craftsman-style entry door opens to an airy interior awash in whites and pale creams, high ceilings, wide white trim, and large windows framing the lush views. 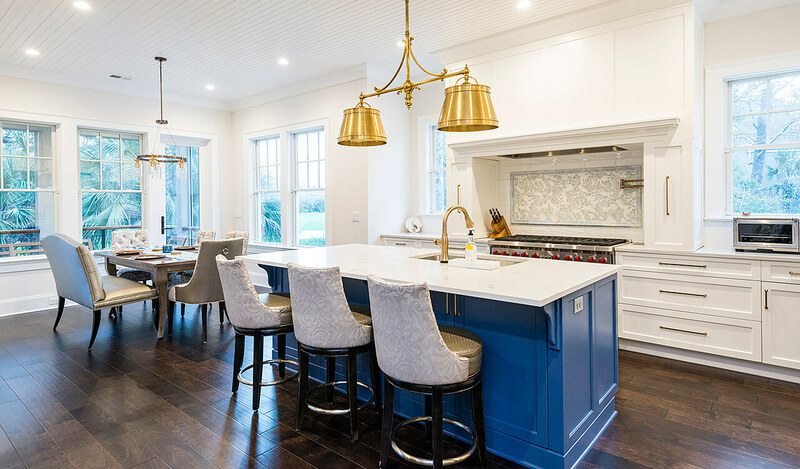 Hand-scraped birch hardwood floors, stained deeply, form an appealing contrast and anchor the open floor plan. 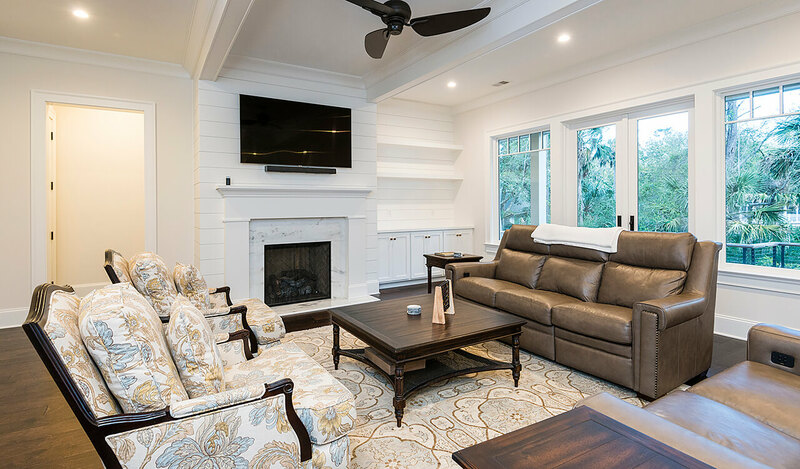 The foyer opens into a living room with white ceiling beams, a gas fireplace set into a marble surround and shiplap accent wall, custom cabinetry, and glass doors leading to the sundeck. 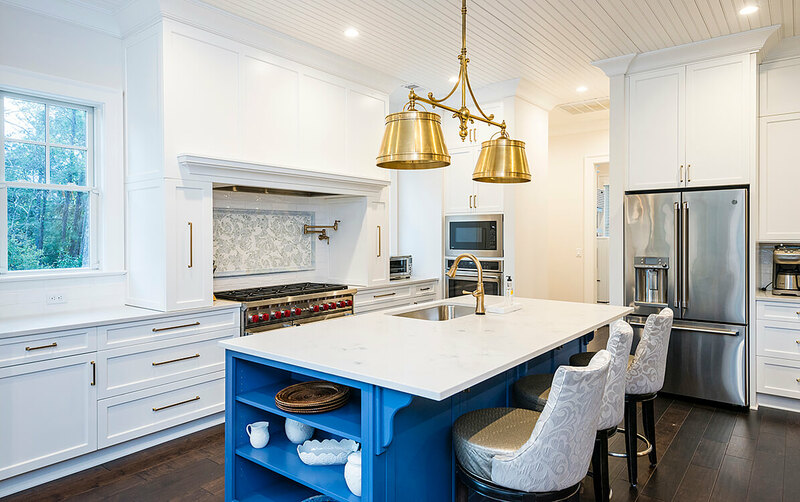 It opens into a white chef’s kitchen with an expansive center island painted in blue offering extra seating for three. 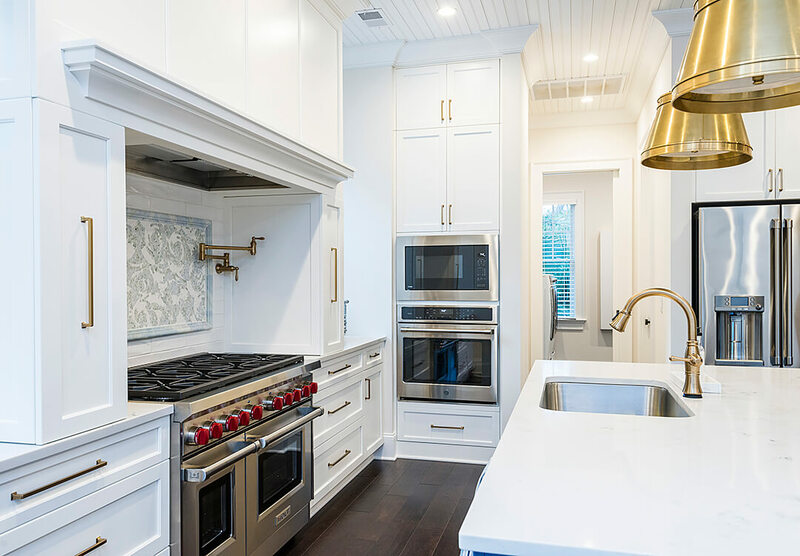 Clean Shaker-style cabinetry with slim, modern cabinet pulls reaches from floor to ceiling, pairing with a pantry to offer ample storage space, and the Wolf® gas range with dual ovens, custom built-in hood, pot-filler faucet, and custom tile backsplash is a centerpiece. 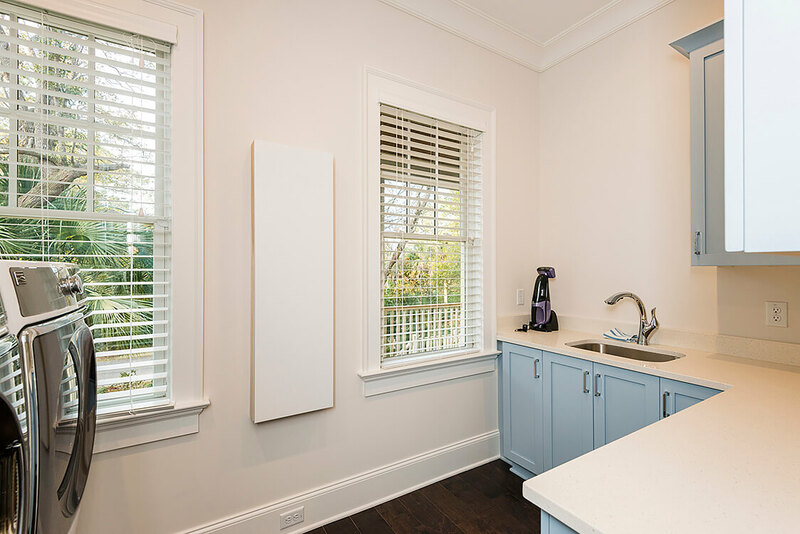 The other stainless-steel appliances are also tucked into the cabinetry, from a wall oven to a large refrigerator with water dispenser. 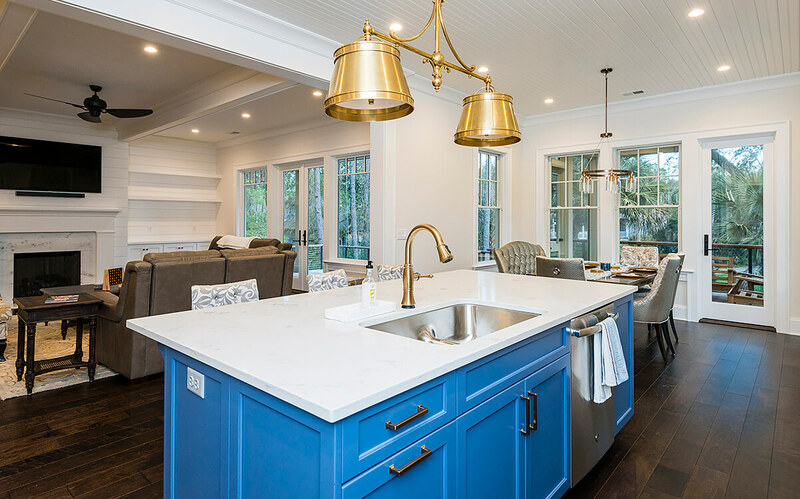 The pale quartz countertops are pristine. 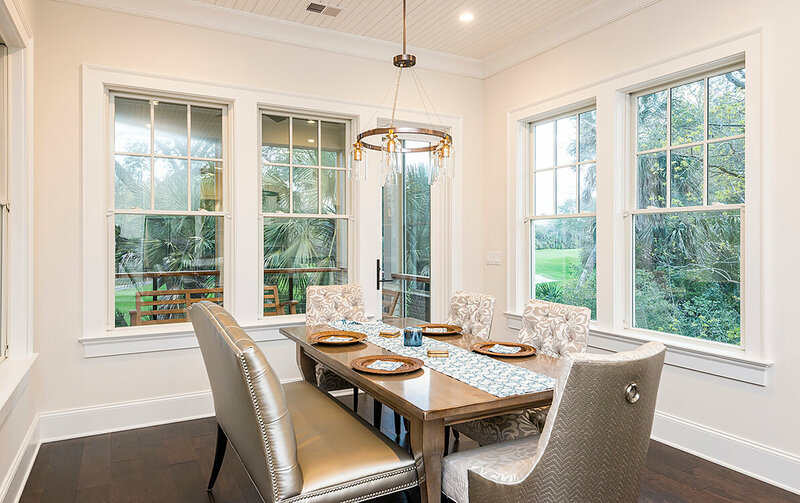 Adjacent to the kitchen, surrounded by windows, is the dining room, easily accommodating six or more on comfortable upholstered seating. 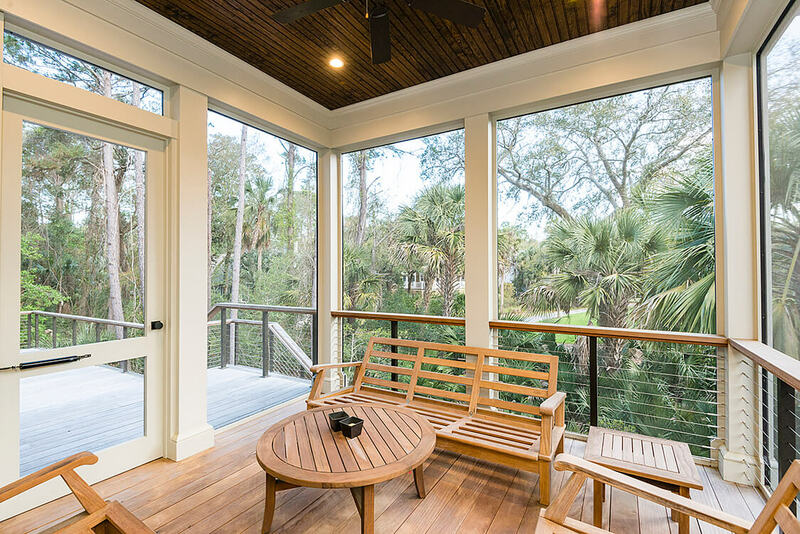 A glass door leads to the screened porch, inviting lounging in the fresh air among the palmetto trees. 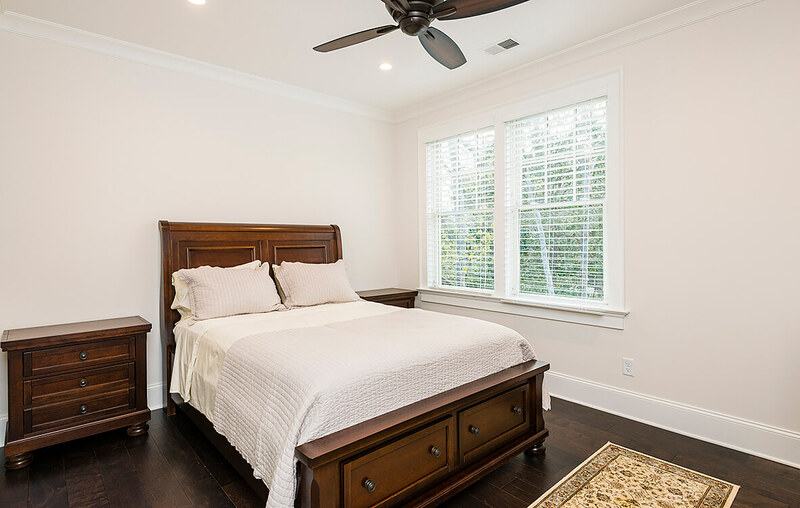 Also perfectly placed among the treetops is the airy first-floor master suite. 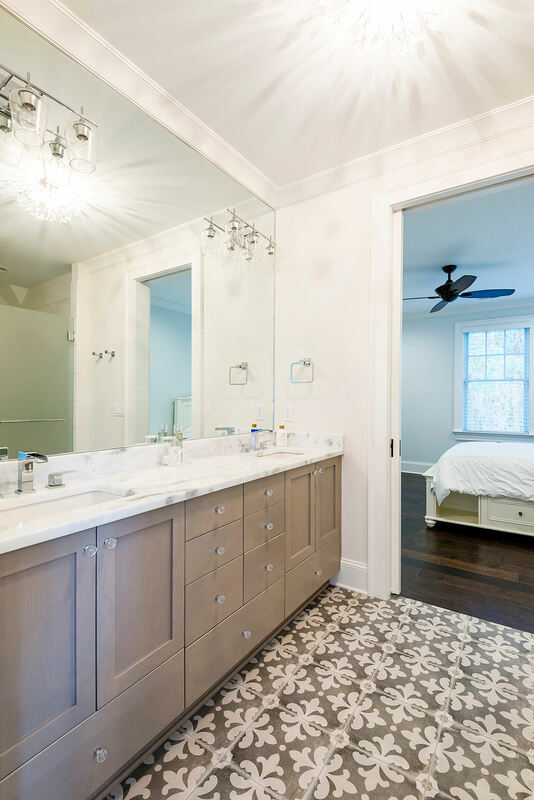 Natural light fills the bedroom from tall windows, and Juliet doors lead to the master bath with a his-and-hers vanity with thick marble countertops, lovely taupe cabinetry, and a seamless mirror extending to the ceiling. 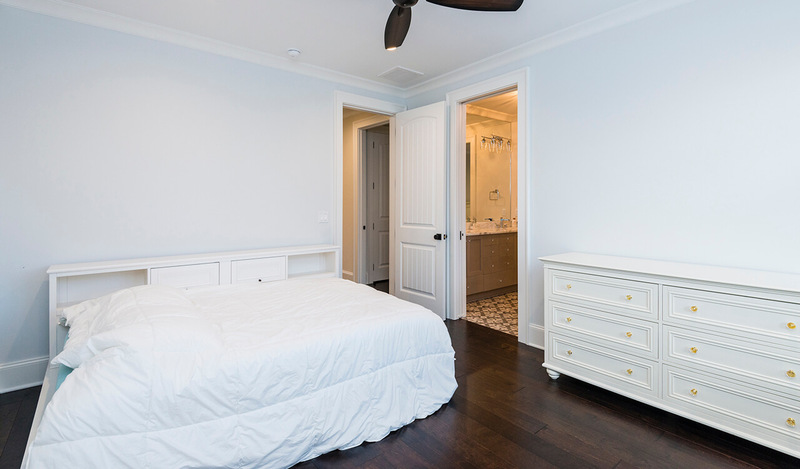 Pale ceramic tile flooring changes to hardwood in the walk-in closet and dressing area with built-in shelving and drawers. 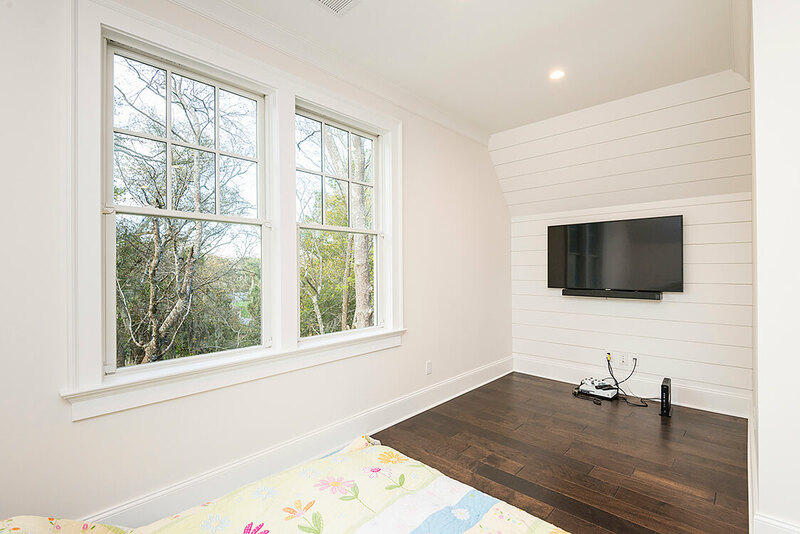 Upstairs is an open loft with shiplap accent wall serving as a game or media room that can double as extra sleeping space. 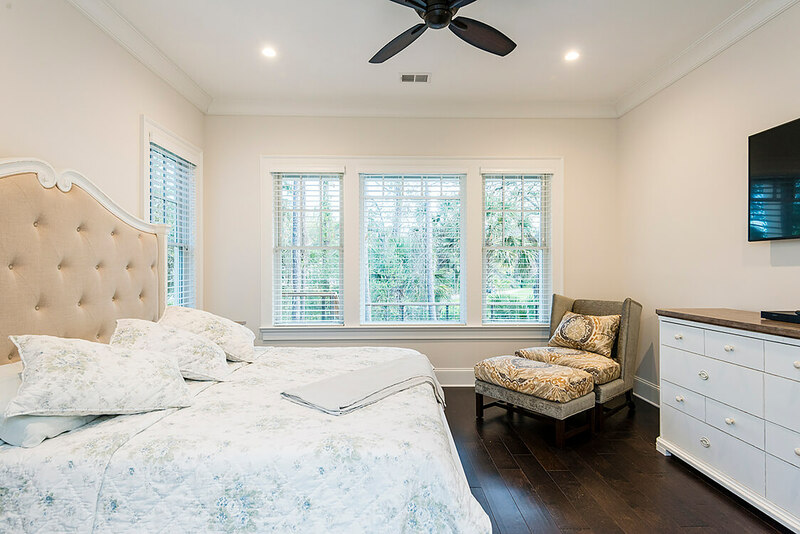 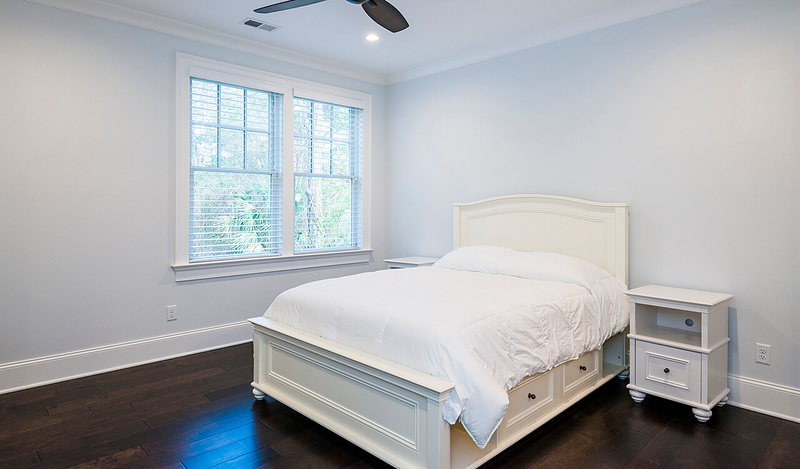 Around the corner are the three guest bedrooms, with high ceilings, lovely white trim, and windows framing the views. 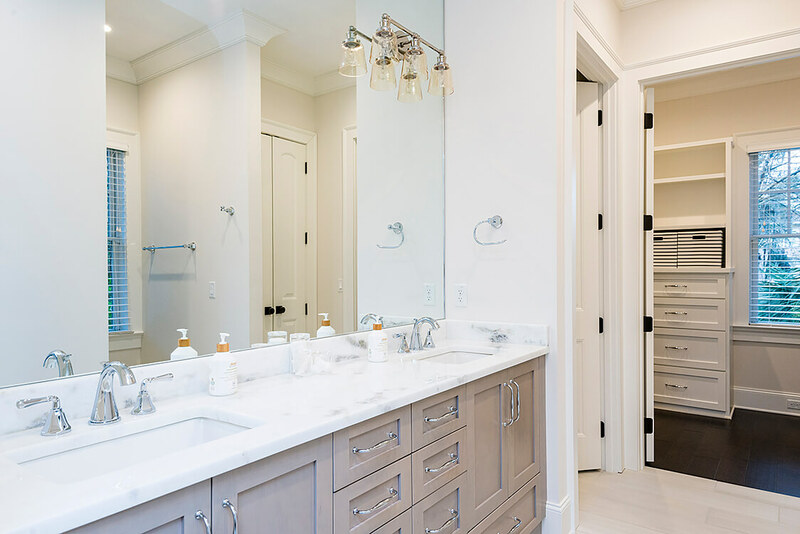 One bedroom is en suite; the other two share a full bath with a spectacular custom-tiled floor, marble countertops, his-and-hers sinks, and walk-in shower. 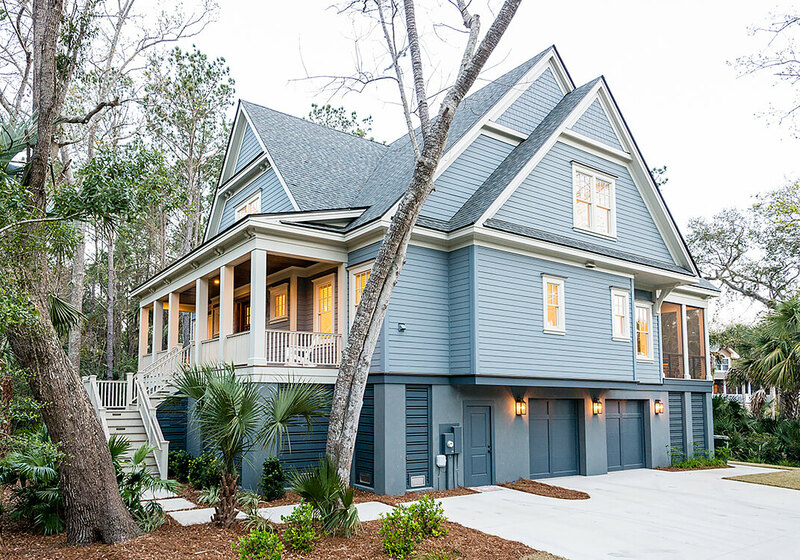 Additional features of this fully furnished home, located in Kiawah’s desirable Egret Pintail neighborhood, include a home office, windowed laundry room with sink and cornflower blue cabinetry, elevator shaft, garage fitting three cars or a 20-foot boat, impact-rated windows and doors, tankless water heater, irrigation system, low-maintenance 30-year cement board siding, architectural shingle roof, and a builder’s warranty.